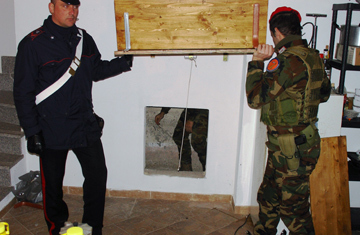 This handout picture released by the Italian Carabinieri on March 8, 2011 shows policemen presenting the entrance of a bunker where Mafia 'Ndrangheta boss Francesco Maisano was arrested during the Crimine 2 operation in Palizzi. The mob has gone global. That's the conclusion of Italian prosecutors in charge of an international sweep on Tuesday that sought the arrests of 41 suspected members of the notorious 'Ndrangheta criminal organization, with arrest warrants issued as far away as Canada and Western Australia. The often brutal 'Ndrangheta is native to the southern Italian region of Calabria, the toe in the peninsular boot, where tight ties of blood and marriage and a deep penetration of nearly all aspects of society have challenged those who have tried to bring it down. But when six 'Ndrangheta members were massacred by a rival gang outside a pizzeria in Germany in 2007, the group sprung to international attention. And last summer, Italian prosecutors discovered the organization had built a strong presence in northern Italy, after arresting dozens of suspects  including senior government workers  in Milan. On Tuesday, prosecutors confirmed that 'Ndrangheta has now spread its reach across the mountains and over the oceans, with six arrests in Germany, three warrants issued in Canada, and two issued in Australia. "The model of organization that's in Calabria is being replicated in many parts of the world," says Giuseppe Pignatone, the region's chief prosecutor. "It's the same types of association, whether we're talking about Calabria, Milan, Canada or Australia." The 'Ndrangheta is increasingly considered the most powerful of Italy's criminal organizations, eclipsing the Sicilian mafia through links to the Colombian cocaine producers that have allowed it to seize a large share of the European drug trade. In its home base, the organization's influence is said to be nearly absolute. "No one believes the central government has much, if any, control of Calabria, and local politicians are uniformly seen as ineffective and/or corrupt," wrote a U.S. diplomat in a 2008 cable released by WikiLeaks. "If Calabria were not part of Italy, it would be a failed state." The Italian research institute Eurispes has estimated the 'Ndrangheta's illegal activities pull in more than $55 billion a year, equivalent to roughly 3% of the Italian economy. And the group's overseas operations are alleged to be concentrated on laundering illicit funds. But unlike in earlier eras, when criminal organizations ran overseas operations as quasi-independent fiefdoms, modern technology means the 'Ndrangheta's Italian bosses can directly oversee its worldwide activities. "There's continual contact with the original country of Calabria," says Pignatone. "When it comes to contracts or disputes, the final decision gets made here. The head of the snake is here." According to Antonio Nicaso, author of The Bad Weed, a book about the 'Ndrangheta co-written with an Italian prosecutor, the Calabrian criminal organization has been able to maintain its family-based network even as it has expanded overseas. Those named in the warrants issued in Australia and Canada were born in Calabria. "They are franchising," says Nicaso. "Like McDonald's using the same bread, same hamburger, [the 'Ndrangheta] use the same way of operating, the same way of putting people together in Calabria as they do elsewhere in the world." What makes the 'Ndrangheta particularly dangerous, says Nicaso is its ability to combine deep-rooted traditions with sophisticated business techniques. In Switzerland two years ago, members were taped performing a loyalty ritual that appeared in testimony from Calabrian mafia trials in the 1880s. Meanwhile, the organization has started using countries in Central Africa to stockpile drugs to be shipped in small quantities, bringing supply-on-demand business practices to the cocaine trade. "It's an organization capable of changing techniques, to find more avenues, more ways to make money," says Nicaso. The challenge, he adds, will be to mount a global response to the 'Ndrangheta's international expansion. Italy's main weapon in the fight against organized crime has traditionally been the law banning association with the mafia, a charge that has no parallels in countries like Australia and Canada where suspects must be proved to have actually committed a crime. Nicaso doesn't believe the Italian mob will be reined in until the nations into which it has extended its reach move closer to an Italian approach. "The mafia is becoming more and more borderless," he says. "But the fight against the mafia is restrained in borders, sovereignty, differences in jurisdictions. Other countries should realize that 100 years ago, the mafia was an Italian problem. Now the mafia is the world's problem."